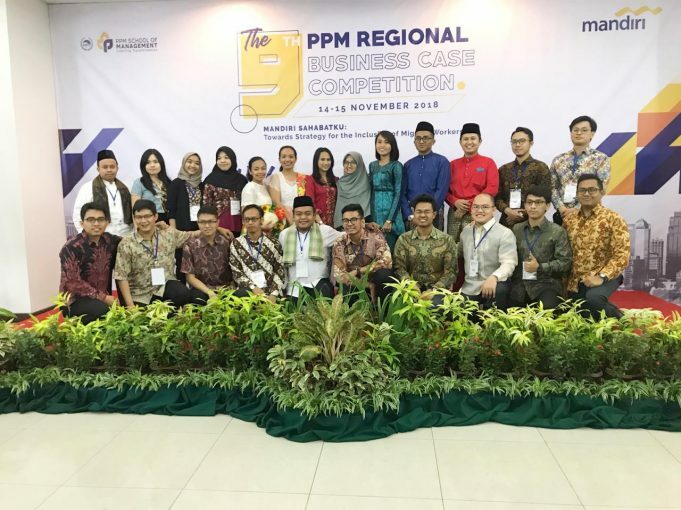 Jakarta – On November 14th-15th 2018, three students of the Master of Science Program in Management FEB UGM managed to become the top 9 finalists in the 2018 PPM Regional Business Business Competition held at Mandiri University, Jakarta. The three students are Raden Roro Hasthi Nurroktriana Mispawanti, William Wendy Ary, and Nia Ariyani Erlin, who are members of the “Athena” team. PPM Regional Business Case Competition is an annual event of PPM School of Management (PPM SoM), which is the 9th year of competition for business cases at the Asian level. The issue raised in this case of competition is the issue of migrant workers. The paper entitled “Mandiri Keluargaku” and “Poin Keluargaku” as an Escalating Strategy of Mandiri Sabahatku Program, succeeded in bringing the Athena team to the final nine after eliminating 50 previous teams. The Athena Team offers a solution to migrant workers to harmonise migrants with migrant families through ‘Mandiri Keluargaku’ and ‘Poin Keluargaku’. In an interview with the Athena team, Raden Roro Hasthi Nurroktriana Mispawanti who is familiarly called Rara said that “Never be afraid to get out of your comfort zone, when we try new things outside campus activities, we will get new lessons related to special skills such as communication skills, arguments and express opinions “.